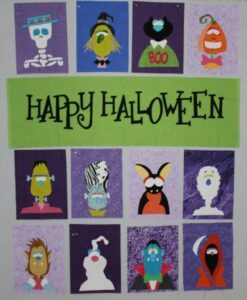 Happy Halloween is coming along – the buttonhole stitching has been completed on seven blocks. I thought I had all the thread colors needed to do the stitching, but discovered that I didn’t. The thread (Superior Threads Kimono Silk) came in the mail today, so the plan is to finish all the blocks by Sunday evening. The next steps will be adding all the details to the faces, cutting the blocks to the correct size and adding sashing & cornerstones. I set up the Juki to sew some string blocks in between working on the applique. 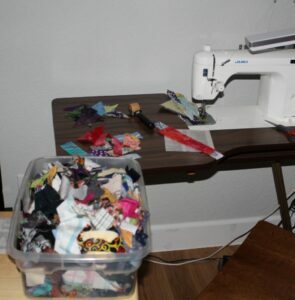 My string bin was full, but I know that it won’t look any emptier when I finish with the string blocks. 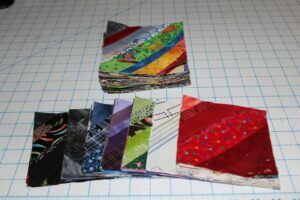 After looking through Bonnie Hunter’s String Fling book, I decided on two sizes – 5 1/2″ anything goes blocks and 5″ one-color blocks. Right now I am thinking of using the 5 1/2″ blocks for Charlotte’s Basket and the 5″ block for Zuckerwatte, but I reserve the right to change my mind. You have my permission to change your mind! Thanks, can I quote you? Sometimes I can make a decision almost before I know I need to and other times my brain is like a merry-go-round – it won’t stop so I can get off. Right now the string blocks are on my internal merry-go-round, although it is slowing down.